Will Malik’s worldview, shaped by his years with the socialists, Charan Singh, the Congress and V P Singh, help him govern the troubled state? Or would his rule have the imprint of the party he joined in the latter years of his chequered political career? It was a dispiriting beginning. On a wintry afternoon in early 1988, Vishwanath Pratap Singh, and some of his comrades-in-arms, all of whom had either recently quit or had been suspended from the Congress party, drove to Baraut in western Uttar Pradesh in a Jonga to address the first meeting of their fledgeling outfit, the Jan Morcha. Satya Pal Malik, then barely in his early 40s, was an upcoming Jat leader from the area and had taken care of the arrangements. As Singh, Arun Nehru, Ram Dhan and Malik sat in the Jonga, which Malik owned, the sight before them was demoralising. Barely a couple of thousand people had turned up to listen to Singh, who was then being lionised in the press as the great anti-corruption warrior. Some of the journalists who covered the meeting could have scarcely imagined that Singh would be the prime minister of India in less than two years. But events unfolded quickly in the months to come. Neither Singh nor his comrades, which included the likes of Mufti Mohammed Sayeed and Arif Mohammed Khan, lost hope. Malik, who was then serving his second Rajya Sabha term from the Congress party, was already a veteran, having been associated with five political parties and experienced enough to sense his opportunity. By August 1989, all Opposition MPs quit the Lok Sabha. Malik was the only Rajya Sabha member to quit. He won the 1989 Lok Sabha elections from Aligarh on a Janata Dal ticket, and was made the minister of state for parliamentary affairs and tourism in the V P Singh government. The coalition government also had Sayeed, who had walked out of the Congress along with Singh, as the country’s home minister -- the only Muslim to ever occupy the portfolio. In Malik’s appointment as Jammu and Kashmir governor last Thursday, his nearly four-decade-old association with the Mufti family, the fact that he doesn’t hail from the Sangh Parivar background, and was a key associate of Singh, who is still held in great esteem in Kashmir, are reasons that have contributed in making up Prime Minister Narendra Modi’s mind. Malik was born in Meerut in 1946, and raised in Baghpat in a Jat farming family. He graduated from Meerut College, headed the college students’ union, and subsequently successively won the Meerut University students’ union elections in 1967 and 68, while also completing his LLB. Malik was a member of the Samajwadi Yuvajan Sabha, the youth wing of the Socialist Party, in his initial years and was mentored by freedom fighter Captain Abbas Ali. According to people who have known Malik, he used to be a “firebrand” student leader, and some of his associates even describe him as a radical socialist when he came into socialist leader Raj Narain’s influence. In December 1970, he married Iqbal Malik, and took to journalism to make ends meet. Malik started writing as a freelancer for weekly Hindi news magazine Dinman. By early 1970s, Malik was in the inner circle of Charan Singh, the country’s most popular farmer leader, who had already been a chief minister of Uttar Pradesh. In 1974, Malik entered the UP legislative assembly on the ticket of Charan Singh’s party, the Bharatiya Kranti Dal. A year later, the BKD merged with the Socialist Party, Piloo Mody’s Swatantra Party and Biju Patnaik-led Utkal Congress to form the Bharatiya Lok Dal. Malik was a general secretary of the Lok Dal. According to sources, Malik was a key negotiator to get the Indira Gandhi-led Congress to prop up the Charan Singh government when the Morarji Desai-led Janata Party government fell. In 1980, the Congress, which was now back in power at the Centre, sent Malik to the Rajya Sabha. He remained the party’s general secretary for several years and also got a second Rajya Sabha term in 1986 but again showed his political perspicacity to throw in his lot with V P Singh. When the Singh government fell in November 1990 and the Janata Dal split, Malik went along with Chandra Shekhar, and eventually joined the Samajwadi Party. He unsuccessfully contested the 1996 election on the SP ticket from Aligarh. After some years in political limbo, Malik joined the Bharatiya Janata Party and unsuccessfully contested the 2004 Lok Sabha polls from Baghpat against his former mentor’s son -- Rashtriya Lok Dal’s Ajit Singh. In the BJP, Malik handled its farmers’ cell and was one of the party’s national vice presidents, but was never in the thick of things until he was appointed the governor of Bihar after Ram Nath Kovind shifted to the Rashtrapati Bhavan in 2017. 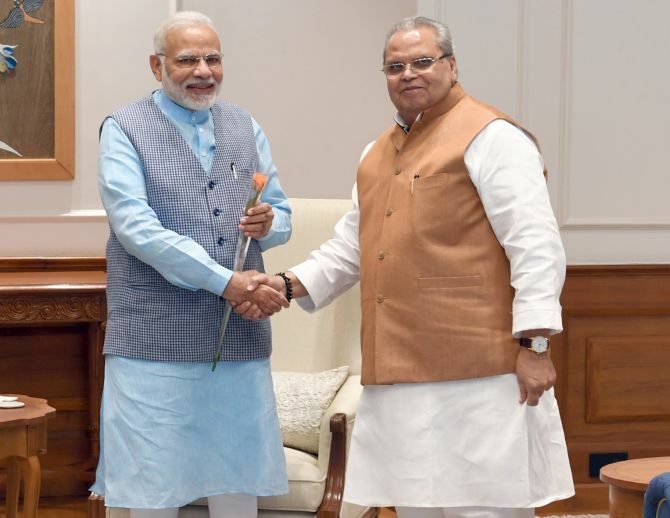 When Malik was sworn in as the governor of Jammu and Kashmir, the state currently under President’s rule, he became the first politician to helm the administration of the state since militancy hit it in 1983-84. Malik isn’t a dyed-in-the-wool Sangh Parivar worker, and his association with the Mufti family is evidence that Modi has walked the talk of his Independence Day speech promise to the people of Jammu and Kashmir that his government would pursue the path of insaniyat (humanity) advocated by former prime minister Atal Bihari Vajpayee. An old associate of Malik’s, to bring out the 72-year-old’s nuanced understanding of the Hindu-Muslim problem, remembers that he once said when a Hindu turns communal he is termed a patriot, but when a Muslim becomes communal he is condemned as an anti-national. Malik’s challenge would be to initiate development works in the state, manage competing aspirations of the state’s three regions, and reach out to the entire spectrum of political parties and other players to create a situation favourable either for a new government to be formed or fresh elections held. Those are the questions that the next few months will reveal.